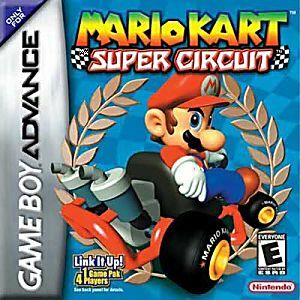 Mario Kart Super Circuit GBA Game Boy Advance Game Cartridge Cleaned Tested and Guaranteed to Work! I missed out on this as a kid so I didn't know how great the graphics and controls are in the GBA! Seriously this is a great Mario Kart title and even better with a friend! Absolutely love this game. The cartridge was in perfect shape. This game is, without a doubt, the worst Mario Kart ever. But... that's okay! It's still a metric tonne of fun. I never got a DS or any of its successors, so this game is the perfect way for me to Kart in a portable format. Got this game super fast and addicted to it Thanks Lukie’s Will be definitely be buying more. My son loved this game, as well as his mother lol. Thank so much! I always loved Mario Kart 64 when I bought it for myself in college. Classic Mario. Mario is always good, clean fun. Now, I can take Mario Kart with me on business trips. GBA Graphics: Don't be fooled! This game is really good! The graphics make it sound lame but they're acceptable. If you have a DS and play GBA on it, you'd think why not buy the newer Mario Kart DS probably. Both are good in different ways so I think both are worth buying.This game's levels are mostly very simple like Super Mario Kart and I noticed two used the same background just colored differently! This game includes all the levels from Super Mario Kart plus all new tracks. The weight and speed system is now introduced but multiplayer can't be done with CPUs only real people connected to your GBA(too bad DS owners...)sadly. All you need is one MK Super Circut cartridge for up to 4 players though! Game is great, great condition, nice classic for the kids. hours of fun! The game came in a like new condition, I'm very impressed with it and the service I have received from Lukie Games. Will buy again!